Washlets! A / C, laveuse / sécheuse, lave-vaisselle, WiFi, et un parking. Profitez de la beauté tropicale d'Oahu de ce condo hawaïen contemporain de deux chambres et deux salles de bain (723 pieds carrés plus 151 pieds carrés lanai). - Balayage à 360 degrés sur Waikiki, les montagnes Ko'olau et l'océan Pacifique. Détendez-vous que vous appréciez le coucher du soleil ou profiter de la promenade facile à la plage, des boutiques, des restaurants et un supermarché! Cet établissement non-fumeurs occupe un bâtiment de sécurité ouvert 24h / 24 et peut accueillir 4 personnes. Au cours de notre saison de vacances (12 / 20-1 / 4) il peut y avoir un minimum de 7 nuits. S'il vous plaît vérifier avec notre service de réservation pour plus de détails. 30+ séjours de nuit peuvent inclure une réduction (non disponible dans toutes les saisons)! POUR LES RESERVATIONS LE MEME JOUR, L'ENREGISTREMENT EST GARANTI POUR 17H00. CHECK-IN IS 3 p. m. - CHECK-OUT IS 11 a. m.
Puisqu'un autre invité peut partir le jour même de votre arrivée, vous devez réserver le condo pour la nuit avant votre arrivée afin de garantir un enregistrement plus tôt. - Désolé, nous ne fournissons pas de parasols de plage, de jouets de plage, de papier d'aluminium, de sacs à fermeture à glissière, de café, de condiments, d'assaisonnements, d'huile de cuisson, d'adoucissant et d'eau de Javel. Enjoyed our 10 day stay. Close to all amenities including beach. Small stick vacuum cleaner . Traffic noise from ala wai boulevard intrudes. Thank you for sharing your feedback for your stay at Fairway Villa. Hope you're able to plan a return visit soon! Bryan is very helpful and accommodating. He walked through the entire community condo and explain alongside. Clean, great location, short walking distance to lots of restaurants and shops. Good location, great view, not as nice as photos pictured. Thank you for sharing your comments, Dennis. We hope you'll be able to plan a return visit soon as we manage over 150 vacation rentals in Waikiki! Condo was as depicted in photos. Taking a closer look, though, there were some minor maintenance/cosmetic issues but nothing that impacted our stay there. This condo is showing it’s age. Cracked bath tub tiles are more than likely allowing water to flow behind them. Caulking tape around tub serves no useful purpose. It is loose and detached at some location and does nothing to block out water entry. Looks tacky too. Would highly recommend adding additional slip prevention to bottom of tubs. A bit dicey when trying to take a shower. Stove is functional but pretty beat up. Broken storage drawers at bottom of stove. Refrigerator was pretty load when it turned on. A shelf in kitchen cabinets is falling down. Second bedroom a/c unit was a little iffy. Now all this sounds bad but let me reiterate that though this is not resort style living it is still far from a “bed bug inn” type of accommodation. Parking was interesting. Getting to our spot was like driving an obstacle course. But doable. 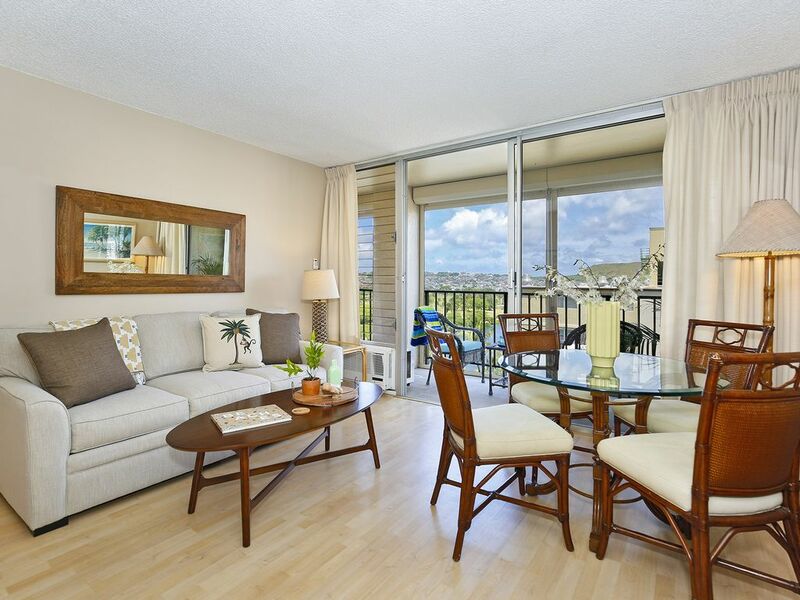 The price was right and location was centralized making Waikiki very walkable. Amenities were abundant. Even had a small dinner gathering second day there. Lots of dishes, pots and pans, towels and start up accessories. Would I do it again? You bet! Thanks for the stay. A great location, an easy walk to the beach. The neighbourhood has some good restaurants and cafes. The apartment was well presented and a great size. Mahalo, for the wonderful review and recommendation! We're delighted that you appreciated the convenient location of the fabulous condo! We look forward to welcoming you back on your next visit! We stayed for 7 nights from Sep 24, 2018. We were met by the manager at the car park entrance after phoning in from the airport as had been arranged. After negotiating 6 levels of the car park to our spot we then met at the lifts and escorted to the apartment for a detailed inspection and instructions which was 1st class. The place is a 2 bedroom / bathroom with a more than adequate kitchen and living area. My only concern was that we found the double bed on the small size. It was by far the smallest we had during our 3 week stay on the islands. The 2nd bedroom had 2 single beds. The wi-fi was strong and excellent so we were able to keep in touch with family, friends and business colleagues. 1217 is right at the end of the building. This gives you 2 views. One from the bedroom overlooks the golf course and canal and up into the hills above. The number of properties in the hills have certainly grown since our last visit. The other view from the 2nd bedroom and living room looks diagonally to the canal and golf course and you can see the back end of Diamond Head. You get some lovely sun rises when sitting on the ample balcony that was stocked with comfy chairs and tables. Level 12 is about 1 level higher than the apartments opposite. Where we come it is interesting to view apartment life and was no big deal. There are manual wind up shutters if you wish to lower them for privacy or to block that early morning sun. We enjoyed those sun rises. I enjoyed the washlets and want to get one installed at home! The apartment is only 2-3 blocks away from the beach. The main shops,eateries and restaurants are also within easy walking distance. There is a supermarket about 100 metres down the street that we used to stock up with our supplies. This is a very self-contained apartment. We enjoyed our stay immensely and we would aim to get #1217 if we came back. Aloha and Mahalo for the wonderful and detailed review! We are pleased that your stay was enjoyable and we met your expectations! Thank you very much for the positive comments. It’s always encouraging when customers acknowledge the good work of our team. Thank you for choosing to stay with Captain Cook Resorts and we look forward to seeing you again soon. Pas de frais de villégiature!